This brand new Bible study series from beloved Bible teacher Kay Arthur and the teaching staff of Precept Ministries tackles important issues in brief, easy-to-grasp lessons you can benefit from personally or as part of a small group. Each book in the series includes six 40-minute studies designed to draw you into God’s Word through basic inductive Bible study. As Kay explains, "Rather than simply reading or listening to what others say about a subject, you are going to see for yourself what God says about it." Join one of the world’s most respected Bible teachers in a study that will revolutionize your thinking--and your life. 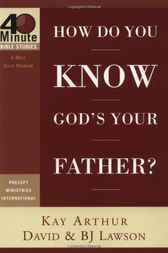 Title: How Do You Know God's Your Father? PRECEPT MINISTRIES INTERNATIONAL, founded in 1970 by Jack and Kay Arthur, has trained millions of people to discover God’s truth for themselves. The Precepts for Life radio and television programs, hosted by Kay Arthur, reach a worldwide viewing audience of over 94 million. In addition to inductive study training workshops and thousands of small-group studies across America, PMI reaches nearly 150 countries with inductive Bible studies translated into nearly 70 languages. David Lawson is the author of Planting and Growing Strong Churches. He is a coauthor of the New Inductive Study Series (NISS) and 40-Minute Bible Studies and is also a featured speaker at PMI conferences and on Precept Upon Precept® videos. David is a former Atlanta police officer and pastor. After nine years in the pastorate he joined the Precept Ministries International full time in 1997 as Director of Student Ministries and as a staff teacher/trainer. BJ Lawson has co-authored many of the 40-Minute Bible Studies. She is a featured speaker at Precept Women's Conferences. BJ joined the Precept Ministries International staff full time in 1997 as Director of Student Ministries and as a staff teacher/trainer.